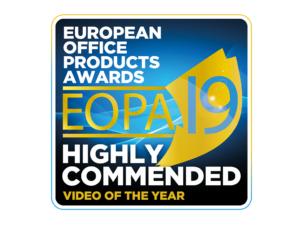 ZenOffice is Highly Commended in the Video of the Year category at the 2019 European Office Products Awards. The Zen Marketing team attended the 18th EOPA’s in Amsterdam where we were shortlisted in two categories for our Print & Promotion marketing campaign ‘What does print mean to your business?’ for Video of the Year and Marketing Campaign of the Year. This is the second shortlist success story for our print campaign, after winning the regional Digital Communications Campaign of the Year award at the Chamber Business Awards in September. Although we didn’t win, Zen received a Highly Commended mention in the Video of the Year category, something we’re extremely proud of. Up against industry giants; Brother, HP, Pilot and Samsung, it was an honour just to be shortlisted and be recognised for the effectiveness of our Print Walk video made in-house, without a budget. Zen extends a huge congratulations to all of the winners on the evening, particularly our category winners, Fellowes Brands and Brother, and we look forward to future shortlist encounters.